Bellator Fighting Championships today announced the signing of fast-rising heavyweight knockout artist Ron “The Monster” Sparks to an exclusive long-term promotional agreement. The hard-hitting Sparks earned his spot on the Bellator roster with a devastating 50 second knockout of the previously undefeated Greg Maynard during Bellator 30 in September of this year. 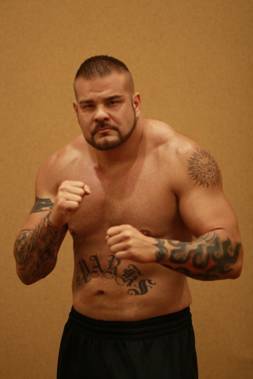 Sparks will take part in Bellator’s next heavyweight tournament, slated to take place in 2011. The 6’4”, 265 lbs. Louisville native owns a flawless 6-0 professional record with an astounding 83 knockout percentage (five TKO or KOs and one decision.) Wasting no time in the cage, all five of Sparks’ combined KOs amount to a total time of just three minutes and 14 seconds. “With his devastating knockout power, natural strength and athleticism, Ron Sparks is a guy who deserves to compete at the next level of competition. I’m glad to say he will be doing that under the Bellator banner,” said Bellator Chairman and CEO Bjorn Rebney. The massive heavyweight found interest in martial arts early in life when at the age of seven his father, a Vietnam veteran who taught martial arts in the military, showed him a Bruce Lee film. Before going pro in 2006, Sparks amassed an unblemished amateur MMA record of 5-0 but found it frustratingly hard to find fights, with many of his opponents backing out at the last minute after seeing the 265 plus pound Sparks. This has also happened in his professional career. Looking toward the next level of his career, the 36 year old is eager to bring his tenacity to the Bellator cage.